Our Valencia roman shades are made with flat panel design to add a classic look to your windows. Simple, elegant flat panel roman shade sewn across the front of the shade to give an extra touch of style. The sides of the roman shades are hemmed and sewn for a quality look and to protect the edges of the shade. 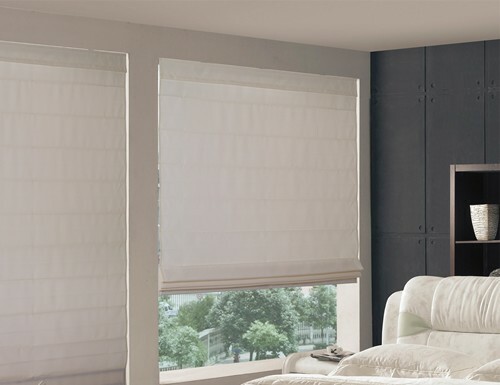 Our light filtering roman shades are made from lightweight 100% polyester fabric or 65/35 cotton polyester blend light filtering fabric. Each Fabric Roman Shade comes standard with flat folds and a five inch fabric valance or a seven inch valance on hobbled fold roman shades. Color coordinated cords and robust cord lock for controlling the height of the shade. Simple installation with snap in bracket. We love the Valencia Roman shades we got for the windows in our dining room around the bay window. We love the Valencia Roman shades we got for the windows in our dining room around the bay window. We are going to get the bay window shades to match soon! Delivery was great and just what we ordered. Everything was as described, staff was very helpful in picking out products and sending info the blinds turned out beautiful and were easy to install. Everything was as described, staff was very helpful in picking out products and sending info the blinds turned out beautiful and were easy to install. very happy! Beautiful! Great quality, just the right size ( custom made) and didn't take long to get here! I will use this site again. Love these and will buy them again for my next cabin. I do wish that the person with whom I spoke and emailed prior to ordering had "strongly encouraged" me to go cordless. With such large blinds, I actually think they should ONLY come cordless. Kinda hard to maninuplate.